I would wager to guess that if you took an informal poll about universally disliked flavors, watermelon would rank quite high (but most likely preceded by that banana Runts flavor everyone loves to hate). 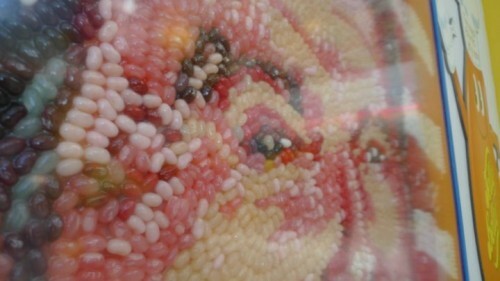 If you didn’t have your fake watermelon fix with regular old Jelly Bellies, you’re in luck my friend. 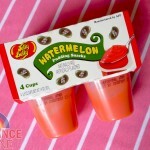 Say hello to Jelly Belly Watermelon Pudding Snacks. Apparently Jelly Belly has been creating all sorts of spin-offs from flavors from candles (yes, that’s candles, not candies) to soda. Ronald Reagan would be proud. 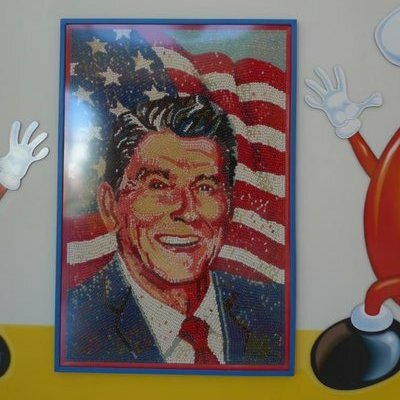 Speaking of Ronald Reagan, if you’ve never been to the official Jelly Belly factory in Fairfield, CA I would highly recommend it. Though I didn’t get to go on the tour because the place was closing for the day, I got to take a look around and spend frivolously on all the jelly beans I wanted to buy (plus they give free samples). Upon entering the facility you’re also greeted with a huge portrait of former governor/president Reagan, made entirely of Jelly Bellies. I think the center of his eye is Cream Soda flavor. Anyway, back to the product. The makers of the pudding, Advanced Food Products LLC tout the pudding as “a fun way for kids of all ages to discover what flavor they are.” If anything, nothing determines your child’s true personality and quirks like them choosing a fluorescent pink Cotton Candy or Bubble Gum flavor or a moody deep Blueberry or tangy Green Apple. If the color isn’t appealing to you, maybe the smell will be. The familiar watermelon aroma was immediate after peeling off the foil lid. 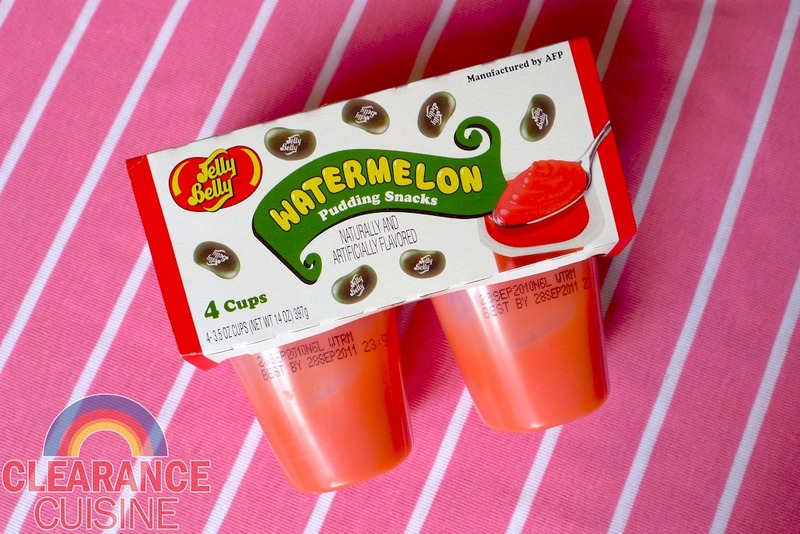 By the way, each pudding cup has 110 calories and 17g of sugar (compared to 35 of watermelon Jelly Belly beans, which have 140 calories and 28g of sugar). 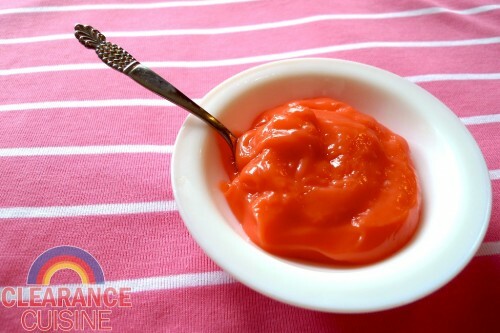 The pink gelatinous mass gently plopped into the serving bowl we used for our photo. While normally I’d eat it right out of the container, I thought this would be a nice change to show off how bright the color really is. As expected, the flavor is almost identical to a watermelon Jelly Belly but with a hint of milk. The texture is kind of a strange combination between traditional dairy-based pudding and a gelatin snack cup. I have to confess I could only take a few bites before the aroma was too overwhelming. If anyone wants three unopened Jelly Belly watermelon pudding cups that are still good until 09/28/2011, they’re yours for the taking. Additionally, Advanced Food Products have also produced “Beanshakes”, a shelf-stable milk-based Jelly Belly flavored blended beverage in flavors like Pineapple Pear and Watermelon. I think I’ll take a pass on those as well. Edit: check out Junk Food Betty’s review here. It has some great imagery too. This entry was posted on Monday, August 15th, 2011 at 8:00 am	and is filed under Food. You can follow any comments to this entry through the RSS 2.0 feed. Both comments and pings are currently closed.